We’ve written about what we consider to be “backpack essentials” for a trip around the world, but we thought we should put together a travel packing list to show exactly what’s in each of our backpacks. 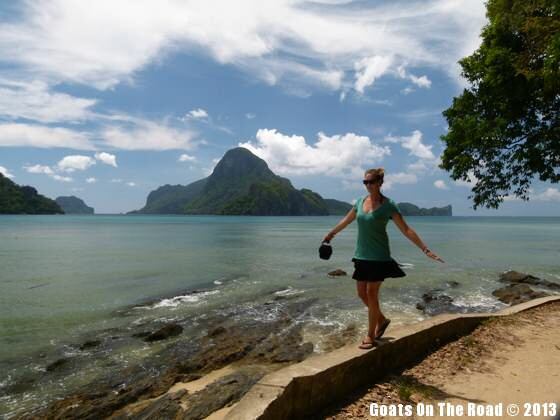 Obviously, there are differences between what Nick packs and what I pack, so this post will be all about what a woman should pack on a journey around the world. My 60L Mountain Equipment Co-op luggage entry backpack. 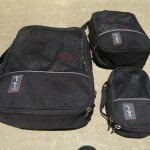 However, before you even attempt to start making a travel packing list, you’ll need to choose a backpack and then purchase the essential travel item: packing cubes. These little things are amazing. They keep your clothing squished down (so to take up less room in your bag) and keep everything organized. Priceless. The most important things a woman should pack when travelling are her intuition and Diva Cup (see below for details). However, if you only brought those 2 things, you’d be freezing cold, but at least you’d be having a comfortable period! A typical looking travel shirt, lightweight, flowing and long’ish sleeves. Worn with hiking pants & shoes. One of my usual travel outfits: hiking pants, t-shirt with tank top underneath, sunglasses and bandana, perfect! A beach outfit: skirt, t-shirt sunglasses and flip-flops. Good to go. ***I don’t choose to carry make-up when travelling. I don’t think there’s any need for it, but if you must, then just bring a tube of mascara and maybe some lip gloss. 1 x Diva Cup – This little silicone menstrual cup has been a lifesaver each month while travelling. It takes the place of pads and tampons so you don’t need to pack hundreds of tampons or worry about where to buy them. You just insert the cup and you’re covered for 8 or more hours…ideal for long, overnight journeys. A must-have in every woman’s backpack. This is a what a heating coil is! 1 x heating coil – We learned about this amazing item only recently. It’s a small coil that plugs into the wall. 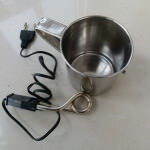 You place the coil bit into a metal cup of water and within minutes the liquid is at a rolling boil. We’ve boiled eggs in a cup, boiled hot water for instant noodles, oatmeal and drinks! 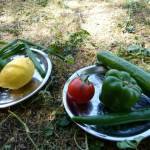 Preparing a salad on our lightweight, stainless steel plates. Electronics. I carry a laptop, an external hard drive, an Ipod and a camera. 1 x mosquito net – Depending on where you’re going, this may or may not be a must-have. Some countries supply them, but they usually have holes in them or smell rotten. We bought ours when we arrived in South Africa and used it all over the continent & in parts of SE Asia. Me trying out a sleeping bag in Kathmandu, Nepal. 1 x pair of trekking poles – unless you’re planning to do lots of serious hiking/trekking, you won’t need these. Mine were bought in Nepal for trekking the Himalayas. Guidebooks. Buy them as you need them, otherwise your bag will be super heavy. Alternatively, download them to your laptop, Kindle or Iphone. Going Camping or Trekking? Check out our What to Pack for a Trekking & Camping Trip post! *We don’t (usually) carry a tent, but if you were going somewhere specifically meant for camping, it would be worth bringing a lightweight one. The name of the game is lightweight, fast-drying clothes. Constantly have that in mind while packing. Bring clothes that you can mix & match, that way you’ll feel like you have more outfits. I tend to go for green, brown, beige, gray and black when choosing colours and then maybe add a bright scarf or something to make it look a bit nicer and more feminine. I don’t recommend bringing any hair product, make-up, a blow dryer, a hair straightener or jeans! Denim is heavy and takes forever to dry. I typically leave my good clothing at home so I don’t have to worry about them getting stained, shrinking or deteriorating from taking a laundry beating! You’ll constantly be buying new clothes, leaving old ones behind and ditching the worn-out ones! So if you think you forgot something, you can buy it overseas, don’t worry. 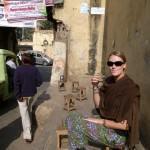 Me in India, definitely not wearing a short skirt anymore! Ok, I think that wraps up the list of what’s in my backpack. 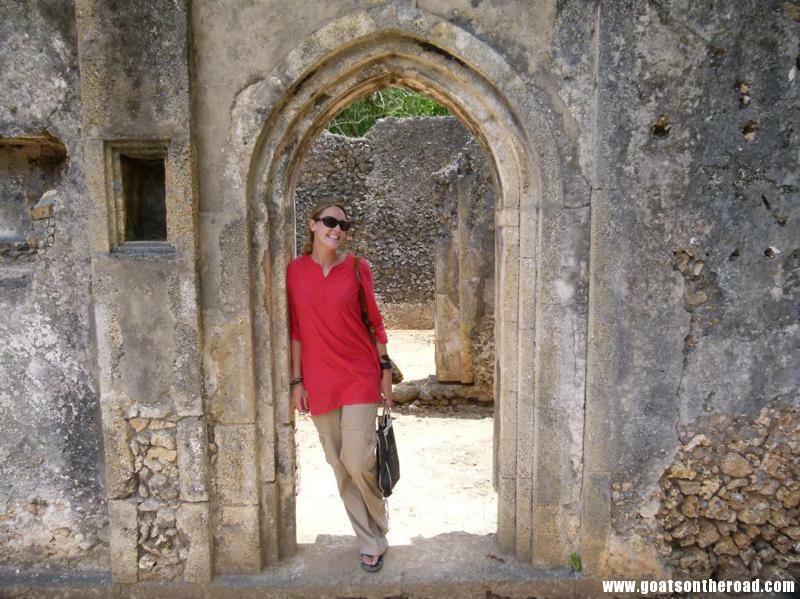 The most important thing is to be mindful of the different cultures and customs in each country you’re visiting. I may wear a skirt and t-shirt in the Philippines, but I’ll change into long pants, long-sleeved shirt and scarf before arriving in India. Be respectful and you’ll have no unwanted or negative attention coming your way! Everyone’s travel packing list is different. Everyone has their personal “must-have’s” but this trusty list has worked for me for my 3 years of travelling the world, hopefully it’ll do the same for you. Guys, check out: The Complete Travel Packing List For Men. What do you think? What are necessities in your backpack…did I miss anything?! 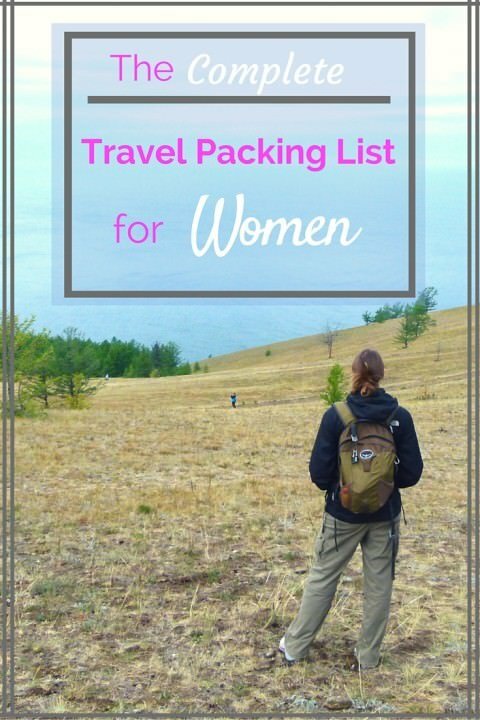 Perfect list for all women!… You covered it to a T. May sound a lot, but if you know how to pack compact, it works well. After unpacking and packing a million times like you have, I’m sure you can pack in the dark. Thanks for the comment Toni! You’re right, after you’ve done it a few times, it becomes such a routine that you can do it really fast…which is great when you’ve slept in and are late for a bus.haha. 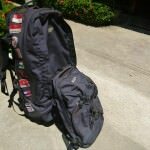 What size packing cubes do you use and how many for your 60L bag? Hello Lina. Thank you for your comment! We each have one big one, 2 medium sized ones and one small one. I carry a 60L bag and Nick’s bag is 70L. The small one is good for underwear & socks and bras. The medium one I put my tops and bottoms and the large one I put my warm clothing and any other odds and ends. The 2 extra medium sized cubes we use for our medical bag & toiletries and “other” ie: headlamps, cups, plates, heating coil, etc. This is a fantastic and comprehensive list for women! I definitely agree that the Diva Cup is a must. Where can we buy one of those heating coils? Thanks for the comment 🙂 You’re right, the Diva Cup is a MUST! As for the heating coils…we bought ours overseas in the Middle East, but you should be able to get one at any small appliance store in any country. Just make sure to ask for it because it most likely won’t be out on display. It was $1 when we bought ours! Good luck! Cheers & safe travels. Very informative article! My days of backpacking are behind me, but I still remember them well. What I would add to the list is: toilet paper, and one or two of those carton folded peeing-for-women things. Don’t know what they are called, but it allows you to pee more easily and less messy when there is no toilet around. Unfortunately with my type of hair I cannot do without hair products, because otherwise I would be left with a bunch of dry, frizzed and untangeable hair:-(. Thanks for the comment! I guess that’s why you’re called the Curly Traveller! You’re absolutely right, some people will need hair product, for me, my hair is straight as can be – it’s air dry and go! As for the toilet paper, yes, you definitely need it, but we just buy it along the way. Maybe have a little packet of tissues to start off with. I never knew what to pack before our first long trip…If I recall, I was actually going to bring a hair-dryer, a pair of high-heels and way too many outfits. Thankfully Nick put an end to my madness and I left with the basics (and still ended up ditching stuff along the way). I have a North Face HyVent coat. It’s windproof, waterproof and lightweight. It can roll up very small. It also has a hood that can be rolled up and tucked under when not in use. I got it for $50 on sale. There are coats that are smaller, but this one has worked well for me, I’ve been dry and warm when I needed to be. Love the Diva Cup!! Agree-a must have for any woman in general, but especially while traveling! Not only sustainable, but convenient. Definitely! A must have for sure, I’m starting to realize that more women have the Diva Cup than I thought! I’d highly recommend LUSH solid shampoo bars and solid jungle conditioner. Each bar lasts longer than a month and obviously you save on the weight of the water! Much more environmentally friendly than leaving plastic bottles behind in countries where there is often no recycling facilities. Curly traveller- I share your pain! Great post! I’m looking for a great pair of hiking pants that also look somewhat fashionable. I like the ones in your picture with the caption, “One of my usual travel outfits: hiking pants, t-shirt with tank top underneath, sunglasses and bandana, perfect!” What brand are these? I’m planning on going to Nepal to trek Everest Base Camp next March/April then India after- really hard to know what to pack. You’ve given me some great idea’s though. Any other suggestions for this trip? That sounds like an epic trip! You’ll want trekking poles, a warm lightweight sleeping bag, gloves, toque, windproof/waterproof pants and jacket. 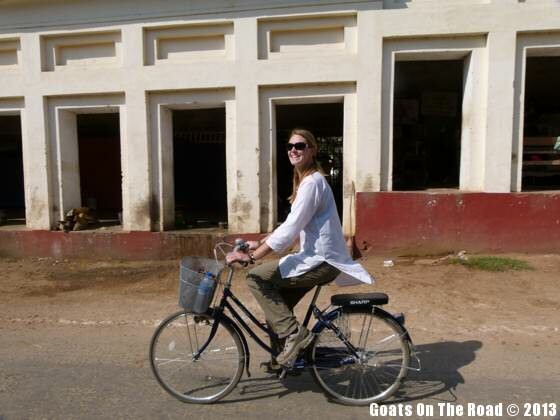 You can get all of these things in Kathmandu, we did…except for the jacket, we had that with us. You’ll also want a base layer thermal top and pants, as well as a fleece top. Obviously, you’ll need good trekking shoes. For India, you’ll want longsleeve or 3/4 length lightweight tops that are long enough to cover your bum! Some sort of loose pants and a scarf as well, all of which you can buy in India or Nepal. I know i cannot wait! Thanks for this,.its been really informative. Happy travels to you too! I love to travel and I make packing easier with packing cubes. Imagine unzipping your suitcase after a long day of traveling and all of your accessories are exactly where you left them. Nothing’s shifted, crushed or wrinkled. It gets better. Packing cubes organize your luggage and make it easy to find things right away. You can easily separate clothes from shoes and makeup from jewelry- talk about organization. If you’re staying somewhere for a night or two, there’s no need to live out of your suitcase or cram everything into your tote, just place your packing cubes in the dresser drawers and there you go- everything you need. Thank you for the comment. Happy packing and travelling! My boyfriend and I are planning to live abroad in many different countries over the next few years – and EVERYWHERE I see women using the Diva Cup! I’m going to have to switch over! Was it hard for you to get used to?? But now I would never go back 🙂 It just takes some practice haha. Wow, great packing list! Very detailed and helpful. Me and my husband are planning our trip on two continents ( South America and Asia) for next year and I already started making plans for what to pack and what not. Thank you for the detailed packing list for women and the one for men, it’s so much easier that way! Greets! Great! Glad it was useful for you 🙂 Happy travels! I’m so glad you found this post useful 🙂 The Diva Cup is a lifesaver! Definitely don’t forget your Diva Cup! It’s an essential and I only wish I’d figured that out sooner.